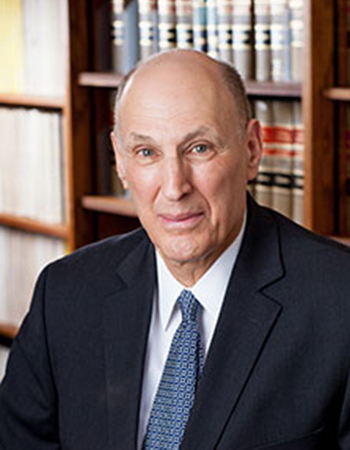 Martin A. Rogoff has been at the Law School since 1972, and in 2017 assumed professor emeritus status. He has published extensively in the area of international law, including several articles in French and Italian. His lifelong interest in France and the French legal system led him to spend a sabbatical leave teaching at the Faculty of Law and Economics of the Universite du Maine in Le Mans, France, where he lectured in French on United Nations law and United States foreign relations law. Professor Rogoff has taught courses such as International Law and American Constitutional Law in France and has also lectured at a law school in Italy. He is an elected member of the French Society of International Law. At Maine Law, he has served as both Professor and Associate Dean. He has taught Comparative Law, Conflict of Laws, European Community Law, International Law, and Legal History. He has also taught Introduction to U.S. Law to Maine Law’s international students. Prior to joining the Maine Law faculty, Professor Rogoff was in private practice in Oakland, California and New York City, and served as an assistant professor at the University of Toledo College of Law. In addition, he has been active in government, at both state and national levels, having served on Maine’s Tax Study Committee and on the U.S. State Department’s Advisory Committee on Oceans and International Environmental and Scientific Affairs. Book Review, 52 AM. J. LEGAL HIST. 214 (2012) (reviewing LEO DAMROSCH, TOCQUEVILLE’S DISCOVERY OF AMERICA (2010). THE FINANCIAL CRISIS of 2008: FRENCH AND AMERICAN RESPONSES (2011) (editor). Fifty Years of Constitutional Evolution in France: The 2008 Amendments and Beyond, 6 JUS POLITICUM (Oct. 2011); reprinted in THE FINANCIAL CRISIS OF 2008: FRENCH AND AMERICAN RESPONSES 1 (Martin Rogoff, ed. 2011). Book Review, 6 JUS POLITICUM (Oct. 2011) (reviewing STEPHEN BREYER, MAKING OUR DEMOCRACY WORK: A JUDGE’S VIEW (2010)). Book Review, 105 AM. J. INT’L L. 819 (2011) (reviewing SERGE SUR, INTERNATIONAL LAW, POWER, SECURITY AND JUSTICE: ESSAYS ON INTERNATIONAL LAW AND RELATIONS (2010), CHARLES LEBEN, THE ADVANCEMENT OF INTERNATIONAL LAW (2010), and OLIVIER CORTEN, THE LAW AGAINST WAR: THE PROHIBITION ON THE USE OF FORCE IN CONTEMPORARY INTERNATIONAL LAW (2010)). Riflessioni Sul Sistema Elettorale Presidenziale Statunitense E Sull’elezione Presidenziale Del 4 Novembre 2008, in QUADERNI DELLA RASSEGNA DI DIRITTO PUBBLICO EUROPEO 11 (Elisabetta Palici di Suni Prat, ed. 2010). La Théorie du Droit et L’histoire du Droit Aux États-Unis: Une Conciliation? 53 ARCHIVES DE PHILOSOPHIE DU DROIT 420 (2010). L’Approccio Delle Corti Statunitensi Alla Scelta Della Legge Applicabile, 2009-1 DIRITTO E POLITICHE DELL’UNIONE EUROPEA 54 (2009). L’imposition et la réligion aux États-Unis, in L’IMPOSTION ET LA RELIGION, ACTES DU COLLOQUE DE L’UNIVERSITE D’AUVERGNE (2006). One, Two, Three, Four, Five, and Counting: A Sixth French Republic?, 10 COLUM. J. EUR. L. 157 (2003). The Individual, the Community, the State, and Law: The Contemporary Relevance of the Legal Philosophy of Léon Duguit, 7 COLUM. J. EUR. L. 477 (2001) (book review). Corruption, Democracy, and the Rule of Law in France, 15 TUL. EUR. & CIV. L.F. 107 (2001) (book review). Droit comparé de la responsabilité politique aux États-Unis, in LA RESPONSABILITE POLITIQUE: LEXIQUE DE DROIT CONSTITUTIONNEL (Philippe Ségur ed., 2000). The European Union, Germany, and the Länder: New Patterns of Political Relations in Europe, 5 COLUM. J. EUR. L. 415 (1999). Il Problema Della Rappresentazione Di Gruppi Di Minoranza in un Sistema Elettorale Maggioritario: Recenti Sentenze Della Corte Suprema Degli Stati Uniti, DIRITTO E SOCIETÀ, no. 4, 2008, at 659. The French (R)evolution of 1958-1998, 3 COLUM. J. EUR. L. 453 (1998). Federalism in Italy and the Relevance of the American Experience, 12 TUL. EUR. & CIV. L.F. 65 (1997). L’Enseignement du Droit Iinternational aux États-Unis, in SOCIETE FRANÇAISE POUR LE DROIT INTERNATIONAL, ENSEIGNEMENT DU DROIT INTERNATIONAL: RECHERCHE ET PRATIQUE 169 (1997). Interpretation of International Agreements by Domestic Courts and the Politics of International Treaty Relations: Reflections on Some Recent Decisions of the United States Supreme Court, 11 AM. U. J. INT’L L & POL’Y 559 (1996). Le Fédéralisme Devant la Cour Suprême des États-Unis, REVUE DU DROIT PUBLIC, May-June 1996, at 759 (with Pierre-Henri Prélot). La Recente Giurisprudenza della Corte Suprema degli Stati Uniti, DIRITTO E SOCIETÀ, no. 1, 1996, at 141. The Obligation to Negotiate in International Law: Rules and Realities, 16 MICH. J. INT’L L. 141 (1994). La Cour Suprême des États-Unis et l’Affaire des Réfugiés Haïtiens, REVUE DU DROIT PUBLIC, Sept.-Oct. 1994, at 1529 (with Pierre-Henri Prélot).